The first tree planted here, a Hitoe Shiro Higan Shidare Sakura (single petal, white, weeping Higan cherry), lived for almost 200 years, was 4 meters diameter and 12 meters tall. The tree started to dry-up in 1928 and died in 1947 but, during this period, Toemon Sano the 15th, a Japanese landscape gardener and renowned “Sakuramori” (cherry tree doctor), planted a few seeds. Then, in 1949, on the place remained empty, he replanted one of the newly grown trees. As you can see, the tree is now simply amazing… From what I learned, the tree had its own problems about 10 years ago, but is carefully cared by Toemon Sano the 16th (the son of the doctor who planted it) and, at over 80 years, the tree looks healthy. 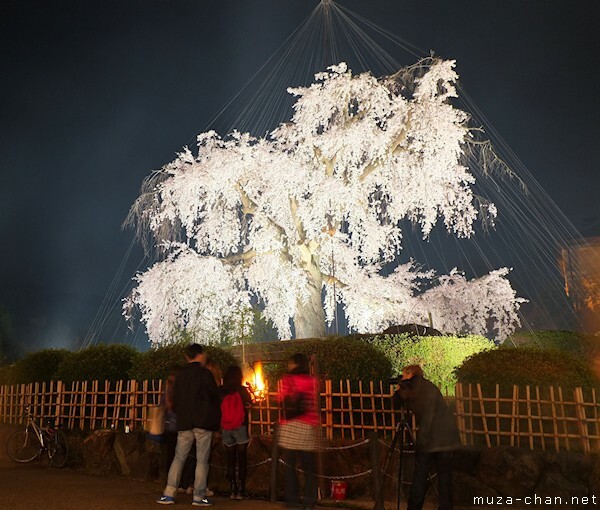 Travel tip: The Gion Shidare Sakura is specially illuminated until April 19, from sunset until 1 AM. At the same time, special fires are lit in metal baskets around the tree.